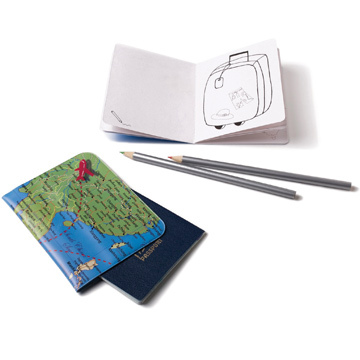 Kids' Map Passport Holder. If international travel with us our little ones, they also have to carry your passport, and what better than in this case. Sometimes traveling with kids can be a bit tricky. But with this child passport case will make the little ones can relax and have a smooth ride. Besides protecting your child's passport, the activity book will keep you busy! Also includes set of 4 crayons. This is what we call a complete service for children (and adults)! Kids' Map passport holder measures 10 x 13 cm.